The founders of the company noticed that many pilots were lacking success due to the lack of a personalized training program. The main reason for the inception of Premier Jet Training was to set itself apart from other training providers, and provide each customers the tools, training, knowledge, certifications, and assistance, to not just be eligible, but to fly a jet aircraft safely as a proficient jet pilot. The training technique used at Premier Jet Training is different from the classical simulator only training programs. All training courses consists of personalized and tailor-made ground school, cockpit procedures, simulation, and in aircraft flight training. The FAA Check-ride is completed in the actual aircraft and all clients have real actual aircraft flight time upon completion of the training course. Because of the great success of the combined training technique, Premier is approved by all major and large insurance companies and insurance underwriters. Premier Jet Training is the alternative to the large training providers who only offer simulator training. Get your Citation Type Rating now! 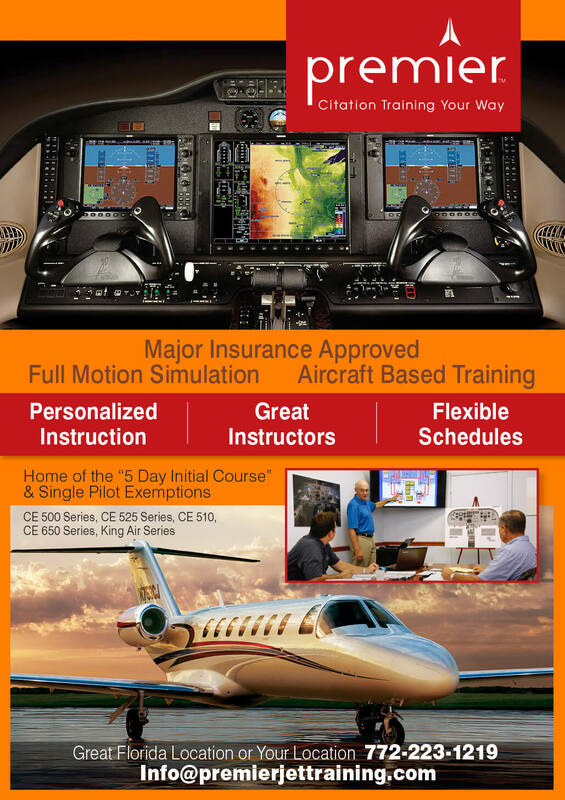 Premier Jet Training own Citation Mustang featured on the cover of AOPA PILOT magazine.